Clubroot is a serious disease that can affect crops from the brassica family. It is a fungal (although more correctly known as a slime mould) infection which attacks the plant through the soil via its root hairs. In a short period of time this will lead to massive swelling, distortion and severely retarded growth. Worst still, the fungus produces cysts that will remain in the soil until a suitable host comes available to re-infect, starting the cycle again. The biggest problem is that these cysts can live in the soil for up to 20 years and are easily spread. In fact, just walking from an infected area onto a clean patch of land will infect your soil. 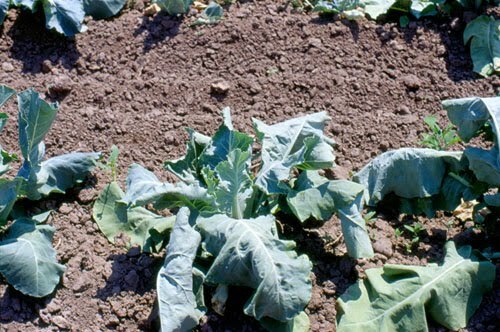 Be aware that clubroot disease will also easily contaminate your soil if it is brought in on infected plants, so do not accept brassica seedlings where the source is not known to be clean. 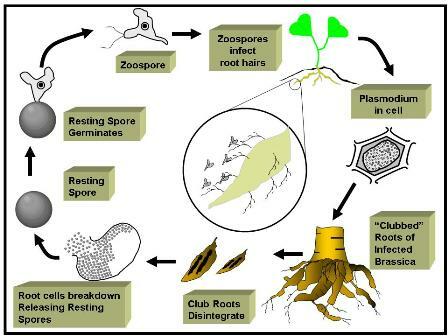 Clubroot can infect whenever the soil is moist and warm, so be aware that most new infections will tend to occur from mid-summer until late autumn. 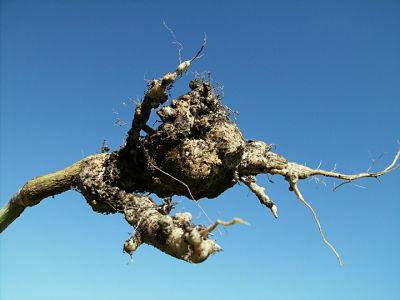 The first sign of you crop contracting clubroot is a characteristic wilting of your plants, especially in dry weather. Infected plants will fail to develop properly and often the crop will fail. As mentioned before, by examining the roots you will notice unusual distortions and swellings. If you have clubroot in your soil then unfortunately you are going to be stuck with it. Even so, don't worry - it is still possible to grow brassica crops successfully with some careful cultivation techniques. Firstly, it is important to practice good hygiene. When your brassica crops have been harvested, carefully remove all the roots but DO NOT compost them, treat them either as household waste or burn them in an incinerator. Remember that the brassica family also includes radishes and mustard, so do not use a mustard green manure on your land and remove radishes that have gone over and once again burn them, do not compost them. This will help to reduce the number of clubroot fungal spores and cysts left lying in the soil. Keep down susceptible weeds like shepherd’s purse, charlock, and wild radish as this will also help to control the club roots life cycle. Start your brassicas off in seed modules using fresh, sterilized compost to which a small amount of lime has been added, then pot them up to between 3 inch or 5 inch pots before planting out. This allows the plant a chance to develop a good root system prior to a possible infection. Club root can be reduced, but not eliminated in open ground, by improving drainage and raising the soil pH by liming. On acidic soils, lime at the rate of 500g per sq m (15 oz per sq yd), with lighter dressings of 270g per sq m (8 oz per sq yd) in future years. Before planting, you may wish to try digging a decent sized hole- at least 1ft deep - and then dusting the sides and base of the hole with lime before planting your seedlings. Consider using clubroot resistant brassica varieties, but remember - this is just resistance and not total immunity.